The Greatest Ever Chess Opening Ideas "
What are the greatest opening ideas in chess history? This is a fascinating question that would undoubtedly spark endless debate and discussion amongst all the experts and enthusiasts of the game. From the invention and development of openings which are now considered to be mainline, to the wealth of stunning one-move novelties which have convincingly overturned previous expert assessments, there is certainly a plethora of brilliant ideas to choose from ? everyone will have their own opinion on this subject! In this book, Christoph Scheerer looks back though chess history and at modern times in order to create his own list of favourites. Selecting from hundreds of candidates, Scheerer examines factors such as creativity, shock value, effectiveness and endurance in order to decide which ideas are most worthy of inclusion. 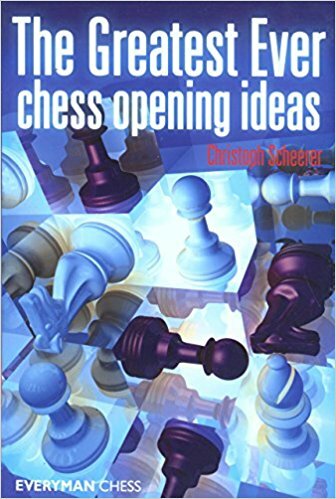 Read this book and discover the stories behind the most powerful opening ideas of all time, and how you can utilize and learn from these ideas to improve your chess.